Hi! Scroll down to the next entry if you're looking for my giveaway. This quilt has dragonflies. These are the last two I did. These are the first two. See that learning curve. I maybe should have practiced more before starting on the actual quilt. I hope the recipient of this quilt doesn't mind too much, that it was kind of a learning quilt for me. Here's something I printed out today. I've been wanting to draw more often. I haven't read it yet but am going to tonight. I bet I can get my boys to draw with me, that would be fun. I have been having fun browsing the giveaways over at Sew, Mama, Sew and enjoying all the comments on my little prize. I have added a few new interesting blogs to my reader. I'll tell you more about some of them in the next few days. Congratulations on your new machine and love the dragonflies!! 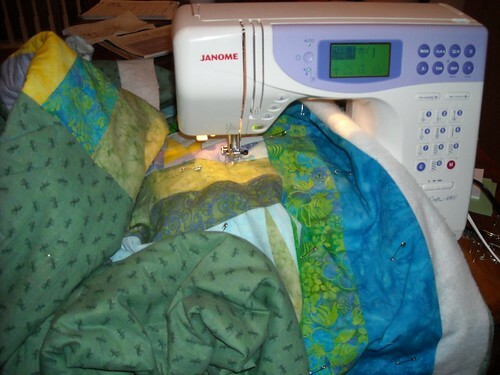 The more you quilt the better you get. And you can only do that on real quilts! Congrats on the new machine. yay for early Christmas presents! I think the dragonflies are darling! Congrats on your new machine. Way to use it right away. I love dragonflies and I love yours. When I do free motion quilting I draw the design on paper. Once I can draw it without thinking about it I can generally quilt it. I think it's the brain memorizing the pattern. Great job! So fun! Love the dragonflies! Your dragonflies are amazing! I never would have thought of that :) Happy new machine and merry Christmas to you!! Good for you jumping right in...both times I got my new machines there was a week or so of reading the manual and just contemplating the possibilities...plus a little bit of fear - what if they weren't as awesome as I had thought? Of course, they were...but it took a bit! Congrats on the sewing machine...love my Janome! Beautiful quilted dragonflies! 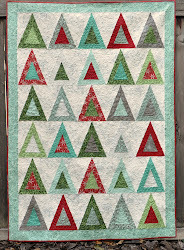 So perfect for this lovely quilt! 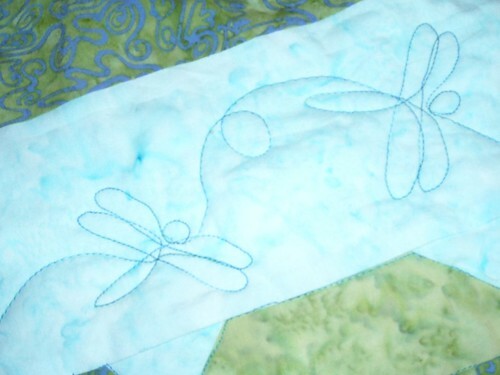 It looks so hard to do but I'd love to try quilting a dragonfly pattern sometime! You rock!